2017 Scottsdale sales totaled $102.4 million (unaudited) and raised nearly $2.2 million for charity during the Scottsdale Auction. Entertainment and sports icons, including Steven Tyler, Justin Bieber, Floyd Mayweather, Dale Earnhardt Jr., Burt Reynolds, Bubba Watson, Reggie Jackson and Michael Phelps, among others, were in attendance. Barrett-Jackson consigned 1,719 vehicles, the most in the company’s 46-year history, set 40 world auction sales records, including the sale of Kindig-It Design’s 1965 Volkswagen Type II 21-Window Deluxe Bus (Lot #1315) that sold for $302,500. The impressive Charlie Thomas Collection, featuring 146 vehicles, sold for a combined total of just over $1.7 million. Over 1,800 automobilia pieces sold for more than $2.5 million, including an extremely rare 1960s Esso Aviation porcelain neon airport hangar sign (Lot #9487), which sold for $82,250. SCOTTSDALE, Ariz. – Jan 23, 2017 – Barrett-Jackson, The World’s Greatest Collector Car Auctions®, kicked off its 46th year by breaking more than 40 vehicle auction sales records (as verified by Hagerty Data) during the 46th Annual Barrett-Jackson Scottsdale Auction, held Jan. 14-22, 2017, at WestWorld of Scottsdale in Arizona. During the automotive lifestyle event, 1,719 vehicles were consigned, the most at one auction in the company’s history, with vehicle sales totaling approximately $100 million (unaudited) at a 99.5-percent sell-through rate. Over 1,800 pieces of automobilia sold for more than $2.5 million (unaudited) bringing the total sales to more than $102 million. Approximately 320,000 people attended this year’s auction, including many of today’s hottest celebrities, professional athletes and entertainment personalities. The Charlie Thomas Collection, which featured 146 vehicles, sold for an impressive combined total of just over $1.7 million, with the top three vehicles including a 1970 Plymouth Superbird (Lot #1284), a 1957 Ford Thunderbird “F” Convertible (Lot #1282) and a 1955 Mercedes-Benz 190SL Roadster (Lot #1283). Eight charity vehicles crossed the Scottsdale block this year, including Rock and Roll Hall of Fame inductee and four-time Grammy winner Steven Tyler’s 2012 Hennessey Venom GT Spyder (Lot #3003). Tyler roared onto the stage to help sell his rare Hennessey, which sold for $800,000, with 100 percent of the proceeds benefiting Janie’s Fund. 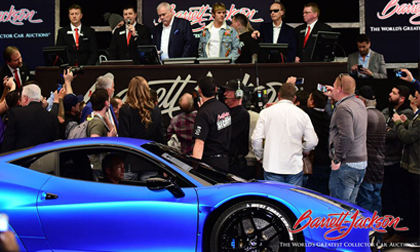 This year’s excitement at Barrett-Jackson continued beyond the auction block and included a variety of automotive and lifestyle activities, including the Coca-Cola Garage and Patio. Other activities included Ford and Chevrolet Ride ’N Drives, Dodge Thrill Rides and complimentary “Behind the Hobby” Collector Car Symposiums. The fun continued with Arena Polo matches, an Arabian Horse Exhibition, Indian Motorcycle Demo Rides, live bands, hundreds of exhibitor and sponsor displays, a DIY Pavilion and the Shell Pennzoil Pioneering Performance Stage. The first to broadcast a live collector car auction in 1997, Barrett-Jackson has pioneered how enthusiasts access its auctions around the world. Today, 20 years later, Barrett-Jackson is the leading collector car auction on the air. More than 36 hours of live coverage of this year’s Scottsdale Auction was shown on Velocity and Discovery simultaneously in the U.S., Canada, U.K. and Discovery en Español. Barrett-Jackson is also the first to pioneer a second screen experience this year with the new Shell Pennzoil Pioneering Performance Stage. Consignments are now being accepted for the 15th Annual Barrett-Jackson Palm Beach Auction April 6-8, 2017, at the South Florida Fairgrounds. For information on becoming a bidder, follow the link to www.barrett-jackson.com/bid. Information on available packages and how to be a part of this world-class lifestyle event is available here.